REI makes some pretty inexpensive GoreTex rain pants. They have short side zips at the cuffs to facilitate big shoes. @locus, a couple seasons ago I bought REI brand rain pants and completely overheated. Maybe if they’re GoreTex, then these you mention are better. Worth looking into. Thanks. Couple of years ago I bought some off-brand low-cost breathable rain pants. Great stuff. I don’t seem to have any trouble overheating in them and I also use them in frigid weather as wind pants. Mine only have snaps to tighten them over my size 11 shoes. I often have to take my shoes off to get the pants on or off. So side zips would be a nice feature. After commuting to work in Chicago for the past 15 summers, this year I’m trying to go as far into winter as I can. Thus yesterday was my first real “snow day,” and the 6.5 mile ride home last night was pretty intense. Traffic was fine and there were no “incidents,” but it sure was sloppy out there. I should have had my neoprene booties with me, and I need a better outer shell pant, but otherwise things worked out pretty well. Regarding winter biking, one thing I’m going to need to sort out is what to do with that messy bike when I get home. I live in an apartment and keep my bike indoors. When I got home last night I initially left my bike on the deck, where I wiped down the frame and cleaned the accumulated slush off the chain as best I could. It was still pretty wet when I brought it in, and it it made a pretty big mess. Next time I’ll try leaving it on the deck a bit longer before bringing it in, but them I’m afraid of freezing up all the water/slush that’s on the bike, which will then just thaw and make a mess when I eventually bring it in. Any tips would be greatly appreciated. @ Jay – wiping the bike down on the deck is a great first step, but leaving it outside will cause it to freeze (speaking from experience). About a year ago I went to Menard’s and picked up 6-feet of the indoor/outdoor carpet with a rubber bottom (sold by the foot). I let the bike drip dry on that. In the spring/fall rains, it also works well and protects my apartment’s hardwood floors. Buy a couple of dedicated “bike towels” at a thrift store. I also like Elizabeth’s carpet idea, though. I have a rubber exercise mat that I use in the garage in the same manner. But at work, I lay down an old bathtowel and let the bike drip dry. Thanks Elizabeth and db. My wife and I have a rubber exercise mat on which we currently park our bikes (in the dining room…classy! ), but a carpet like that would be probably more absorbent and thus mess-fighting. I’m off work the next couple of days (burning through vacation days before year end), so I’ll check out Menards or Home Depot or somesuch. @db – thank you for reminding me to bring a couple of towels in to work for the bike’s drip dry. @peteathome – where did you get your “off-brand low-cost breathable rain pants”? Damn, Liz! That looks like some evil, evil ice! I’d definitely be thinking about some studded tires. And +1 on the towels. I keep one in my filing cabinet with a whole change of work clothes. You know. Just in case. 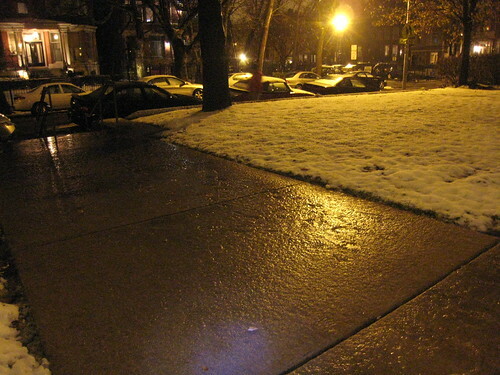 Noah – that ice (slush actually) was very slick on the sidewalks, but the streets were just fine. (thank goodness). So far, so good. Yeah, I just want to get from here to there safely with feeling in all my fingers and toes. I am hoping for better winter weather, soon!